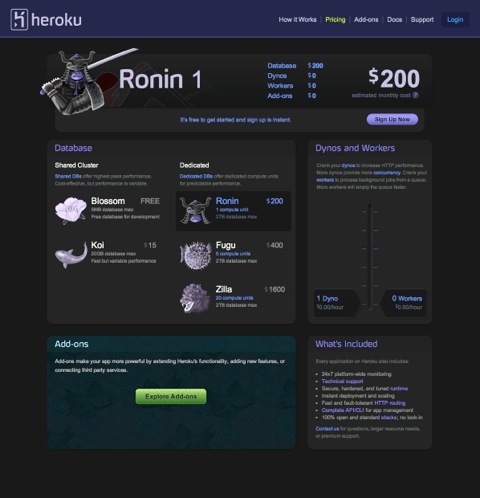 I decided to investigate Heroku’s early years. You can learn a lot from even quite recent tech history (see my previous article on version control). My tool? The Internet Archive. It’s an elephant that never forgets your pivots. 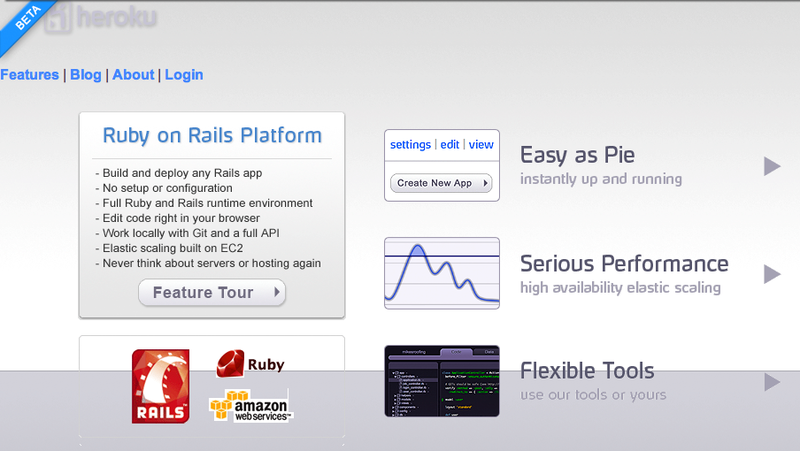 Ruby on Rails is riding high. But impossibly hard to deploy. 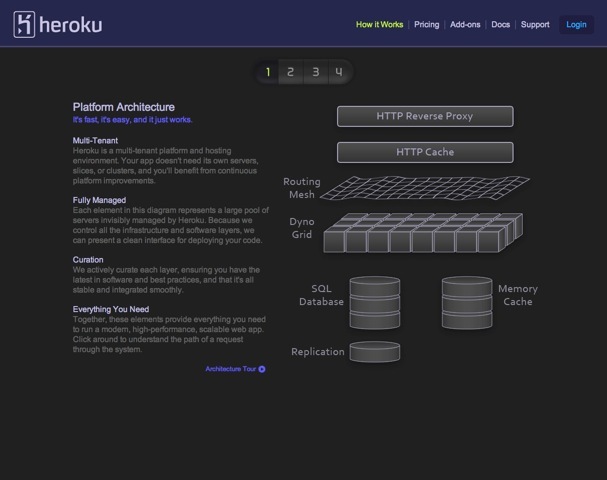 Y Combinator startup Heroku’s first home page (see right – apologies for the lack of images, which archive.org has not recorded) screams onto the web. It’s remarkable just how much it did from the get-go. 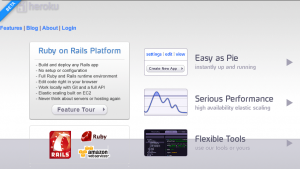 Not only did it solve the Rails deployment problem (“Instantly live!”), but you could also write the code in your browser for the first time (well, since Zope!) 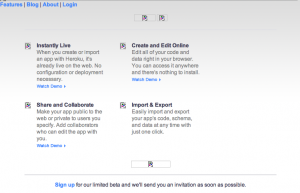 (“Create and Edit Online”), and share it with others (“Share and Collaborate”). 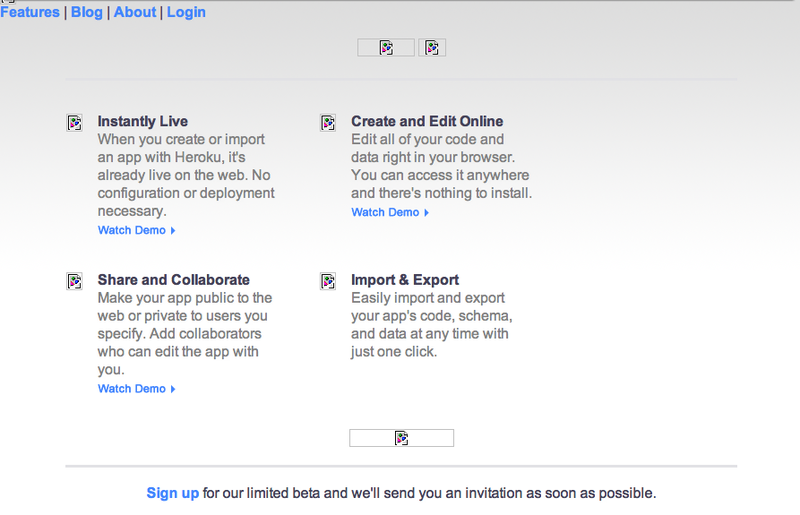 Really, hand on heart, until you read that last paragraph, did you remember that Heroku had an online code editor? And that was a major part of their initial value proposition? And what’s this about sharing? Cleverly, they’d realised people will probably be worried about lock in (“Import & Export”). It’s not clear from later home pages that they really were. No mention of scaling. No origami. 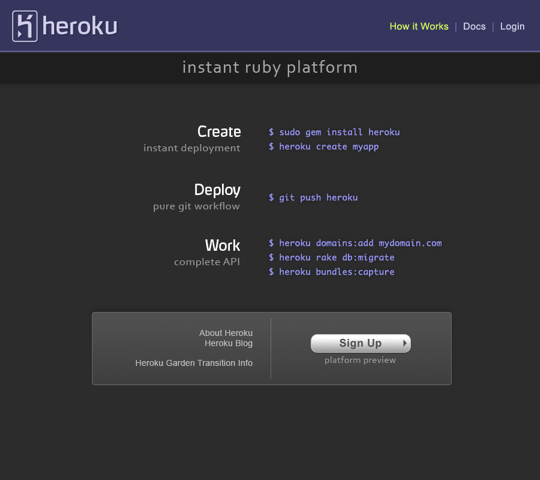 By February, Heroku had its debut on TechCrunch (including screenshot of their online IDE). The home page (see later version of the same with images) talks more about deployment and scaling and git, with still a frisson of “coding in the browser”. Nothing about “sharing” any more. Hosting isn’t trivial, but any solution that starts out “OK, give up your editor and terminal and version control and offline editing” seems pretty fishy for anything beyond the 15-minute blog demo. A whole year passes until Heroku change their home page (see later version of the same with styling) again. Several radical changes. For the first time ever (well, maybe since the early days of the web), actual code appears on the front page of a fashionable website. And not just Ruby or Python code, shell code. My explanation for this suddenly being hip again, is the resurgence of the Mac around this time. OSX makes Terminal.app accessible to people who five years earlier would have used Windows and thought the command line was for dumb retrobates (sic). What a home page! All shiny and black with a fixed width font, and $ signs. Wow. Secondly the value proposition has simplified to three points. 1. Instant ruby deployment. 2. Git. 3. API. The latter two were merely mentioned in passing a year before, now they’re a key part of the value. Github launched the previous April and at this point has 45,000 registered users and is on an exponential growth curve. 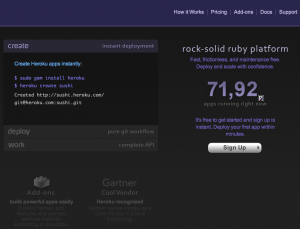 Not too surprising that Heroku give git higher billing this year. The most radical change is what is missing. Have you spotted it? Tucked away at the bottom of the page is a tantalising link. 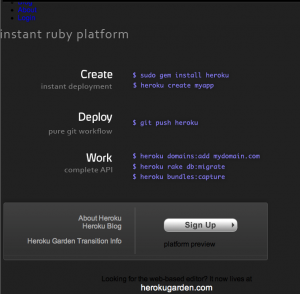 “Heroku Garden Transition info“. WTF? 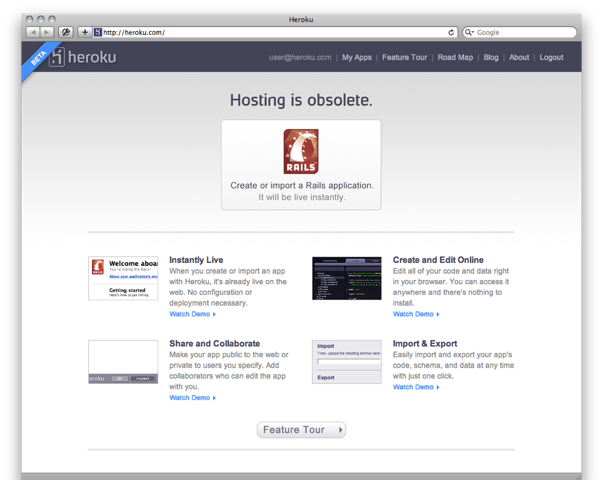 A blog post “What’s up at Heroku” explains. They’ve completely rewritten it. We also learned what our users want from a commercial version of the platform, and surprisingly to us, we discovered that there aren’t just a bunch of features we need to add, but some we need to remove as well (platform features often involve trade-offs). Indeed. No more online code editor. No more sharing. That’s all hived off to herokugarden.com. 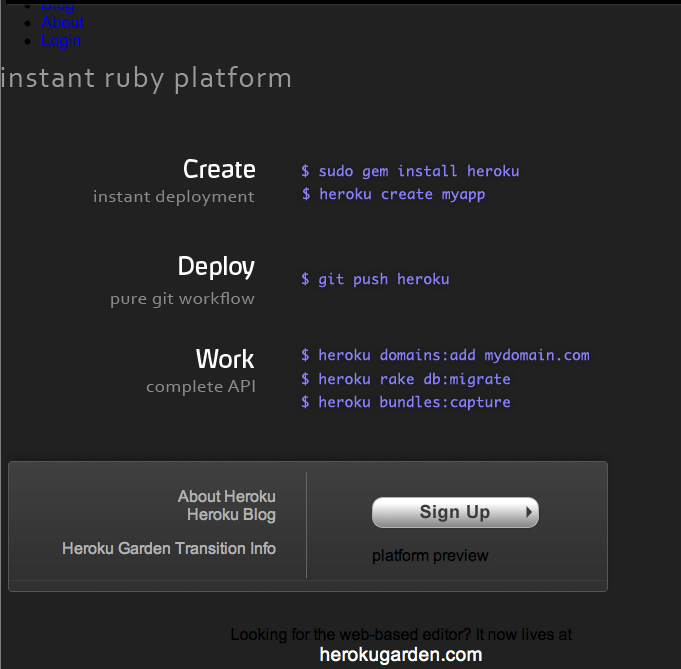 “Learn Rails, Work from Anywhere, Move to Heroku Later” is the value proposition of that new (erm, old) app nursery. In the autumn, it changes again (see later version, much the same with styling). Even more code, more clearly showing you that the commands are everything you need to get started. It’s the geekiest home page ever. That said, there’s a much better split of the page; the value proposition for people who don’t speak /bin/sh is now laid out clearly on the right. Again, the most important thing about this new home page is hidden away at the bottom (at least in the later 2010 version, it’s commented out in the HTML of the original 2009 version). “Add-ons”. Despite throwing away features with their rewrite, an absolute corker of a big new feature appears. 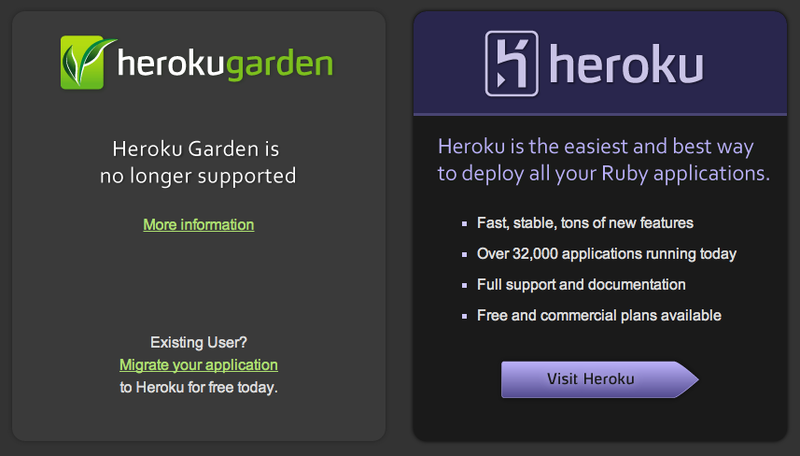 It’s how Heroku becomes effectively “an app store for systems administration”. But that’s another story. 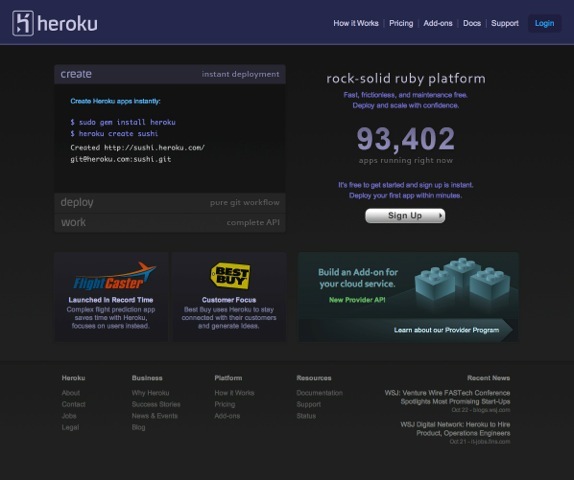 This final home page holds them out well, lasting beyond the next December when Salesforce buys Heroku for $212 million. Cash. If you love the origami, and are wondering when it appears, that is as late as June 2011. In January 2010, just three months after its debut in October 2009, it’s axed. Poor thing. 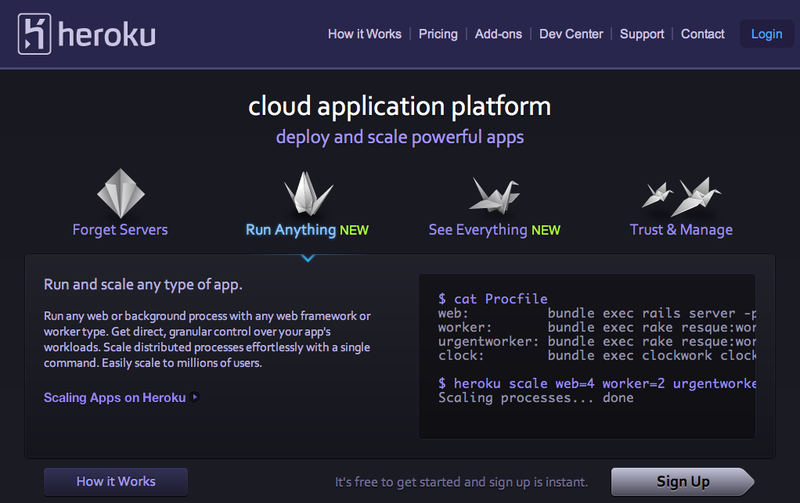 I like to think that one of the founders of Heroku shed a tear. That they’d spent at least a year arguing until they were fit to explode just how important the online code editor was, how a “YouTube for web app sharing”, a “Google Docs for coding” was the next big thing. And then watched the relentless figures, as everyone just used the deployment system, ignoring the editor, ignoring the sharing. Silly, it was the “app store for sysadmin” that won it. For the record, I’ll wager that in 10 years time loads of people will be coding in the cloud. In their web browser, and using apps on their tablets. It seems crazy right now, but you’ll see. It seemed crazy 10 years ago that we’d all be using an online office suite. Meanwhile, remember the lesson. Even the best don’t get everything right straight away. Do several things well. Double down on the ones people like. Awesome post, please write more like this! Great article. Proves that (profitable) online businesses should follow the same rules as offline ones. ‘Smell what sells’, and pursue it. Since this author of this article seems so smitten with the origami I thought I’d share this story. 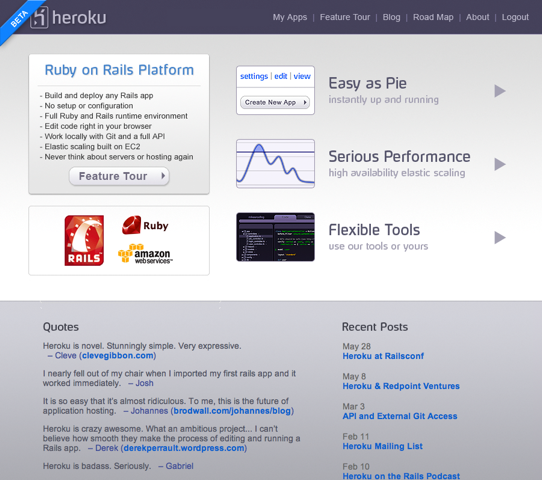 I interviewed with Heroku in May 2011 when the current site design was in its final stages. I had the pleasure of sitting next to our designer, Todd, during that week and watching him create the origami images. It was shockingly low-tech. He folded some paper cranes, then draped his black hoodie jacket over his office chair and put the cranes in different positions in the chair. Then he took pictures of them with his iPhone. He imported those pictures into Photoshop and worked just a little touch up magic to get the final images you see on the site today. Awesome article. Illuminating example of what being lean, pivoting and adjusting is all about. reading it through – gave me some nostalgia. well (you can see the pricing link appears on the late 2009 homepage). lot of crap for it from some PR and marketing folks).